There was a time in most of our lives when “take-out” was the rule of the day. Pizza, Chinese food, Buffalo wings, Mexican and more were often the meal of choice for my college friends and me. Back then “cooking-in” usually meant a dinner of Ramen noodles or scrambled eggs, and for some, even microwave popcorn was a meal. It’s my impression that few “x-gens” and “baby boomers” today have ever attempted to cook their college “take-out” staples at home. Perhaps it’s been so ingrained in our psyches that these favorite foods are too time-consuming or difficult to prepare—and why bother when you’ll probably never achieve that perfect “take-out” flavor anyway? My old college roommate Delton had no such fears. He was always willing to try his hand at something new, even Buffalo style chicken wings. As I recall, the kitchen looked like a bomb had gone off when he had finished preparing, but that hardly mattered once you took a bite of his wings. They were simply slammin’! Now-a-days, I rarely see Delton, as he is usually off leading some white-water adventure in Africa. We caught up recently and he was good enough to share some of his best tips for making Buffalo style chicken wings at home. You can deep fry ’em and go hot & spicy, or bake them up lite with some mild heat. Either way don’t fret it, skip the take-out, and just wing it! (or make your own rub with 1/4 teaspoon each of garlic powder, paprika, & cayenne pepper; plus a dash of salt & pepper. 1/2 cup Frank’s™ RedHot™ “Hot Buffalo Wings Sauce” (Frank’s™ was the secret ingredient used in the original Buffalo Wings created back in 1964). If chicken wings are whole, divide them at the joints into three pieces, keeping the drumettes and wings, and discarding the wing tip. Rub your favorite Cajun seasoning onto wings, or prepare your own rub of garlic powder, paprika, cayenne pepper, salt & ground black pepper. Heat canola oil to 375˚ in deep-fryer. Melt butter in small saucepan; stir in Franks’s™ RedHot™ sauce and a few shakes of celery salt. For a bit more tang, add 1/2 teaspoon of white vinegar (optional). Once seasoned, remove wings from fridge and deep-fry at 375˚ for 10 minutes. 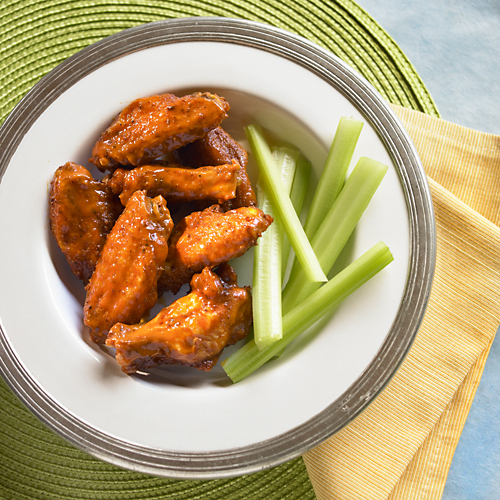 Place cooked wings in glass (or other non-porous) mixing bowl and stir in warm hot sauce. Alternatively, dust seasoned wings with all-purpose flour and place on foil-lined tray. Bake at 500˚ for 20 minutes until fully cooked (lightly browned & slightly crispy). Mix wings with hot sauce and serve.